When we bought our salvaged french doors from Historic House parts two springs ago, we knew they wouldn’t be great for the frigid Upstate winters. They’re single-pane glass, and they could really use new glazing. They weren’t built to be exterior doors, but we just didn’t care. They’re beautiful, they let in tons of light and they make us happy – gas bills be damned. Last winter we layered them up with 4 thick curtain panels, which kept the cold out but also ruined all the fun of having pretty doors since we didn’t see them from October until late April. This year, we’re testing out a solution that just might let us have our cake and eat it too. Voila – we now have a system that holds out the gusting wind and lets in the warm, house-heating sunlight. It seems to be working at least as well as the curtains did; there’s no condensation on the glass when I wake up in the morning, which seems like a big improvement to me. And here’s what it looks like from further away – you can see the foam insulation, but other than that it’s pretty invisible. How is the plexiglass working? I have successfully used the clear plastic film which is stuck on with double-sided clear tape and shrunk tight with hair dryer. 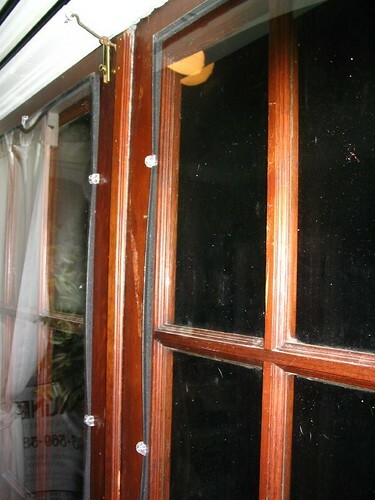 It is invisible,economical and keeps a good air seal to trap dead air against the glass. It keeps condensation from forming on the glass, as moist air does not get in. I have put it on both sides of the window to create a second dead air space. It has been durable enough to leave on through summer (keeps heat out, too) and continue for another winter. Finally, it removes cleanly without peeling my paint around the sash or casing. The only downside is that any moveable sashes are not accessible while covered by the film, unless you put it only on the moveable sash directly, as I have (as opposed to covering an entire multi-unit window). 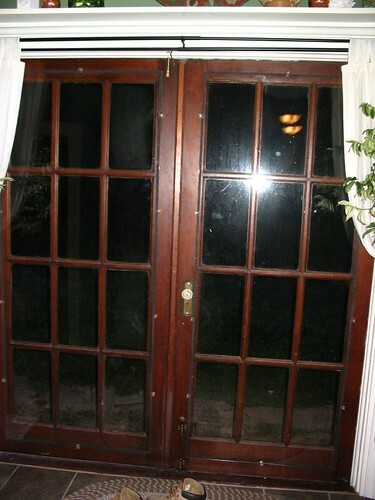 I just bought two french doors that I want on the outside,also! Threes years later but here I am. I’m running into the same problem because my carpenter says they are not energy efficient and I won’t be happy with them. So, it’s nice to know there is someone else out there in the world who likes the same things. I was wondering how your solution worked, or if you tried something else? Love to hear an update. How did the weather affect the doors? Any warping or water ingress?